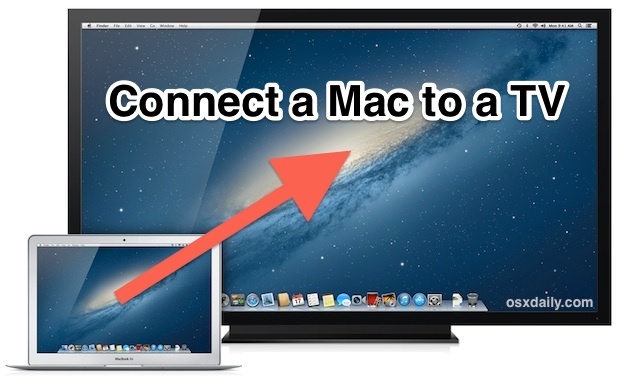 Ever wanted to connect a Mac to a TV screen? Maybe you want to use the TV as a giant external monitor, to play games on a big screen, or just for video playback and movie streaming? It’s actually quite easy to do, and we’ll cover the entire process from start to finish. We’re going to focus on connecting any newer Mac to any fairly modern TV by way of a physical HDMI connection, thus, a few third party accessories will be necessary for the task. The result will be the Mac exporting both video and audio signals to the TV. HDMI is really the best way to connect a MacBook Air, MacBook Pro, MacBook, iMac, or Mini to an HDTV screen, whatever your intended usage purpose is. 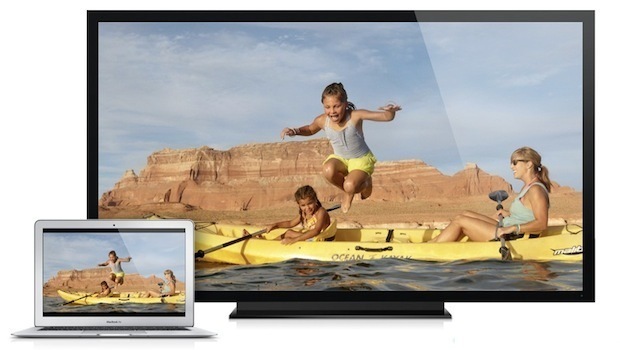 Yes, the AirPlay feature can also export a screen to show up on a TV through an Apple TV box, but the HDMI method has several distinct advantages; it’s cheaper, resource usage is considerably less, there are no slowdowns, the video quality does not depend on network latency, and it’s just generally much more versatile, making the only real downside to the HDMI approach being the physical cable connectivity. Lets get started and cover the basic requirements first. Note about HDMI adapters and audio support: there are many options available on Amazon and some are very cheap, many of which will not actually carry audio despite advertising that they do. Generally, the adapters that cost a little bit more tend to be more reliable, so be sure to read the reviews and make sure that audio does indeed work for the adapter you are ordering. I’ve had the best experience with the Monoprice brand, but your mileage may vary. Also note that for 2010 and older Macs, the Mini-DVI to HDMI adapters do not carry audio at all, thus you will need a separate audio output option that we won’t cover here (external speakers, separate audio cable, etc). If you plan to control the TV using your Mac from a distance, spend a couple extra bucks on a longer HDMI cable. 15 feet is usually adequate for most cases, but if you have a gigantic room you may want a longer cable. For the purpose of this walkthrough we’ll focus on the newer Mac models with a built-in HDMI, Mini-DisplayPort, and/or Thunderbolt ports, this guide was crafted using a MacBook Air and MacBook Pro, but the same applies to newer Mac Mini and iMac models too. Again, note that the latest MacBook Pro models have an HDMI port, so you wouldn’t need an adapter on one of those MacBook Pro models, you can just directly connect an HDMI cable between the Mac and the TV. Establishing the initial connection is remarkably straightforward and is just a matter of physically connecting the cables to one another from the Mac to the TV. If you’re satisfied with this alone, which basically makes the TV an external display, then you can call it quits here. On the other hand, if you’re looking to watch movies through apps, watch web video, or use another playback source from the Mac on the larger TV screen, then you’ll want to take a few additional steps to greatly improve the experience. Plus you’ll probably want to get sound working properly, as you’ll notice by default audio won’t play through the TV screen and stays playing through the Macs speakers instead. Read on to optimize the TV for video playback, get sound working, and for some more tips for having the best experience. 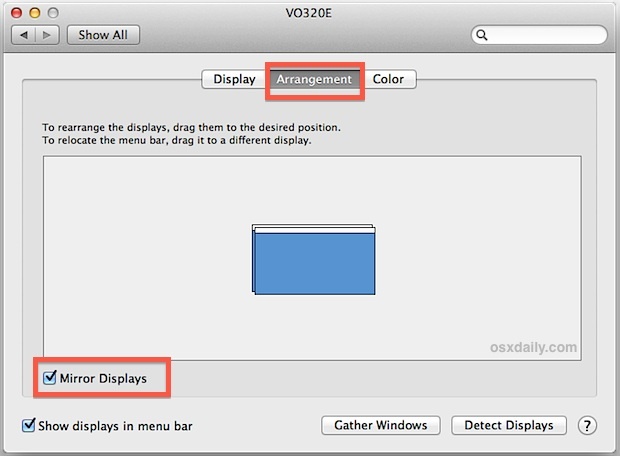 This will reverse the default configuration of a dual-display setup, thereby turning the Macs screen into the extended desktop, and the HDTV as the main desktop where the menu bar shows and apps appear by default. The Output tab will usually show the TV’s model name, but since most people don’t know the model number of their TV that’s fairly meaningless and it’s much easier to just look for “HDMI” in the list. In the screenshot example, the LCD HDTV’s model is “VO320E” for a Visio 32″ but the names are often much more convoluted than that. Note that once you set the audio output to go through the TV you will lose the ability to adjust the sound volume levels through the Mac’s audio output controls, meaning you’ll need to use the TV’s built-in volume adjustment buttons or a remote control. QuickTime Player is also a fine choice for playing .MOV, m4v, .mp4 files, but for other movie file formats like .WMV, Flash .flv, .mpeg, .avi, and others, you’ll want to get a third party app instead. For other formats, VLC is a classic app and should be included in just about every Mac users app toolbox, and MplayerX is becoming increasingly popular for being just as versatile while having the added bonus of supporting BluRay and MKV playback. Both XBMC and Plex are full featured media apps, which are capable of turning a Mac into a media center when they’re running. If you have a spare Mac, you can even turn it into a full-time media center, server, and torrents box, and the Mac Mini is particularly great for that purpose. 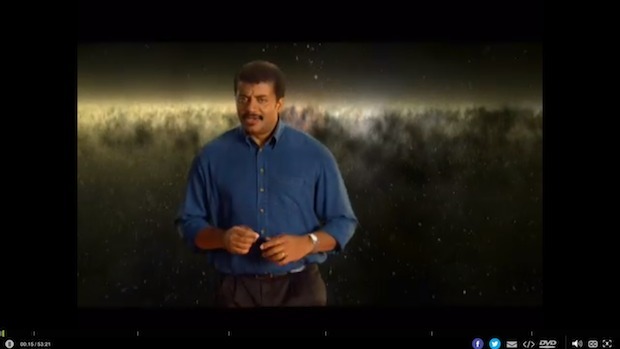 Not all movies or videos will play at true full screen, and sometimes you’ll end up with a large black border around the sides of the video. This is frequently true with many web-based streaming movies, or when playing video that is lower resolution in general. Some playback apps like QuickTime and VLC have the ability to play video at 1.5x and 2x resolution to solve that problem, but for web players and other apps you can just use screen zoom instead. Optionally, check the “Smooth Images” option to attempt to have less pixelation when zoomed in, though this tends to blur the picture for heavy zooming and can look strange. You’re better off trying this out yourself to see if it works for the video you want to watch. Now to put this to you use, play back a video as usual either from a web player or movie file, center the mouse cursor in the middle of the video, and now use the zoom feature to eliminate the black borders. 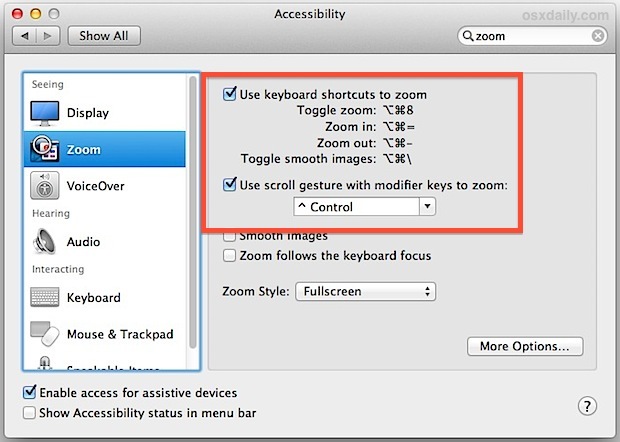 For those who enabled the gesture option, this is done by holding the “Control” key and then using a two-fingered upward gesture to zoom in (or two finger down to zoom out). Much better huh? It won’t do a anything to resolve the lower resolution playback, but at least it doesn’t have the large black bordering bars showing alongside all of the video, making the playback itself smaller than it needs to be. Sometimes just increasing the web browser zoom works too for just web video, but that shouldn’t be considered universally reliable enough to recommend for all situations. That should be about it, enjoy your Mac-TV hookup, go watch some movies, browser the web on an enormous screen, game on the big screen, and have fun! Sidenote: If you happen to have an Apple TV and a Mac running 10.8 or later, you can just use AirPlay Mirroring and do this entire thing wirelessly without the need for any cables or HDMI adapters. Typically AirPlay offers excellent video playback, but on weak wi-fi signals the connection can suffer, which is never a problem with a physical HDMI cable. Plus, the combination of an HDMI adapter and cable is about 1/10th the price of an Apple TV box, making the method offered above a much more economical choice. Thanks so much for this. Just got a 23 inch monitor and was all good for mirroring but was getting the black box when playing videos – which was the main reason I got the monitor. After switching the main monitor to the display as you suggested … Perfect! Thanks for the clear and useful help. hello, i would be grateful if you could tell me if i can connect my mac ibook400 with the tv. actually i don’t see any “thunder symbol” on the left side of the computer so i wonder if i can do it in some other way. This article was extremely helpful!!! Thank you. Hey thanks so much for these awesome instructions but I have my Mac book pro connected to my 42in and I don’t want to have both displays playing is there anyway I can close my Mac while the movie still stays playing? Awesome and exhaustive article, thanks! Terrific instruction – I’ve done it all but when I go to change the sound output, only internal speaker is in the list. The hdmi connection isn’t listed. Any suggestions? Thanks. I am having the same problem. Did anybody ever help you out? If you don’t have the sound option for HDMI it’s likely because the adapter you are using does not support HDMI audio. Many of the cheaper adapters for display-port to HDMI do not support audio, you have to buy an adapter that specifically does support audio output. On new MacBook Pro models you will find there is a direct HDMI port, that will always support audio and video. Have you checked to see if you’re running a blue light filter like Flux, or some other environment adapting software? Typically whatever you see on your computer monitor is what you should see on your TV. Opened my system preferences and then sound, but there is not an HDMI option listed. Internal speakers listed only. Any ideas? I have the same problem as well. It used to go through no problem but for whatever reason, now there is no HDMI option under the “sound” tab of system prefs. Someone please help, I can see the video but have no audio. I’ve been able to connect my Macbook Pro to my HDTV for years with the HDMI cord and Mini Display Port Adapter. But now when I try and connect, the connection of my desktop on the TV screen only lasts for a few seconds, and it goes blank. It will flick back on for a second, and then go black again for a few minutes. I don’t know how or what I am doing wrong, as I am not doing anything different than before. I can’t get my desktop to stay active on my TV screen for more than a few seconds before it dissapears. It seems like the TV or the computer isn’t reading it. But when I use the same HDMI connection for my Apple TV, it works fine. Is my my Macbook, or my TV? I had the same problem with my Macbook pro and TV. The problem resolved when I got a new Mini Display Port Adapter. I was worried it was the TV or the Mac, which are both much harder to fix, but it turned out it was the much cheaper Mini Display Port Adapters so just get a new one. Got a link for the adapter that worked? Good stuff. I’m a tech guy but after a few beers I was too lazy to think for myself. This helped ease the pain. I had to unplug/plug the mini display 2 times after everything was set up to finally get my desktop screen to show up on my TV. However, it works great now and the picture is very acceptable. I have a MacBook (13-inch, Mid 2009) 2.13 Core2Duo running OS X 10.10.1. I’m trying to connect my MB to my TV with a MiniDVI to HDMI converter. When I connect my MB to the TV it flickers like it recognizes it but nothing happens. In my Display settings, it doesn’t offer a Mirroring option beyond Show Mirroring Options in Menu Bar When Available (which I assume would be Airplay, which this computer is not capable of doing). I’m at a loss. I guess it could be a substandard adapter cable but it could be something else too. I’m hoping someone on here has an idea or two. I have the same problem. No clue what to do, can anybody help???? I am having almost the exact same problem as Jason. My computer flashes as well as though it recognizes that something is happening. I do see pages as Option A and Option B above, and I see an option of optimizing the display for a Samsung on my computer, so there is something going on, but no video. One additional question: does the laptop need to be plugged in connecting to a tv? My problem is that I’m using the thunderbolt port for streaming my sample library for east west in pro tools. I also need both the other usb slots for my mbox and ilok. Unless someone invents a firewire to hdmi adapter i can’t hook up to the tv without seriously hurting the speed at which i sample for creating music and without also using a usb hub on my equipment which i’m reluctant to do. What I really wish I could get is an adapter that sends the hdmi from the laptop’s built in bluetooth to a receiver that you plug into the hdmi slot of your tv. I don’t think that’s possible or else it would have been done already, but that would solve my problem better than anything. Thank you!! You’re instructions are clear and easy to follow. You saved me hours!! So glad I found this. I have attached a 40″ HDTV (1080p) to my 2011 27″ iMac. I primarily want it to push secondary screens containing documents or watching a youtube etc. My issue is the fonts on the iMac have all changed, everything is now much smaller. The safari browser fonts, email, ichat, calendar……everything now has much smaller font. I can’t figure out a single setting to put everything on the iMac, back to what it was. Any help would be appreciated, thanks for the great article. I have a problem with Audio; display works just find and has no issue at all but I have checked all possible options but audio still does not work. I don’t know why? I’m using standard HDMI cable; I have Macbook Pro with retina (one of the latest) and I have Samsung SMT27A950 (Series 9) monitor. have tried all available options but could not find a solution. searched web several times but could not find any relevant blog on it. How do I hook my cable box to my iMac to use as a display monitor? While I’m watching a DVD using my mac mini, my TV will turn black with no video signal but I still get audio via my mac mini speakers. Nothing works to get video back. 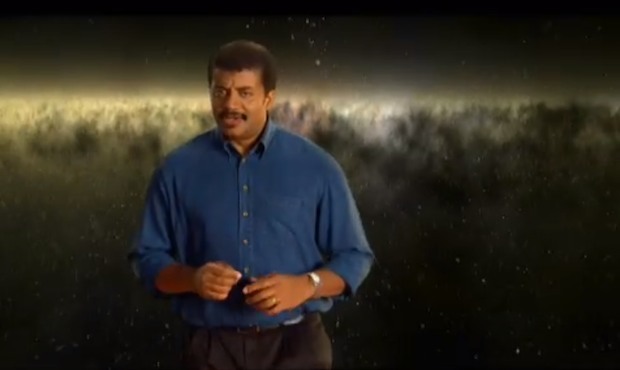 However, after about 5 minutes the video signal returns inexplicably. I can still switch my port to Apple TV with no issues with video or audio but when I return to mac mini, my screen is still black. That’s already happened twice. So, I have a canon rebel t5i and I have a MacBook Air 2016. Also I have a magic black mini recorder(Capture Card). And I want to live broadcast( Wirecast) ,however no sound is being picked up, when I connect the canon to the MacBook. Can you help? Hi, about the sound i didn’t find on the output the HDMI to select? Since the upgrade to OS X EL Capitan version 10.11.3 on my Macbook I have not been able to show my slideshows on the TV via HDMI cable. I did it successfully before the upgrade. What do I need to do? I tried to connect my macbook pro retina display with my 4k TV but I can only hear the sound on the TV and only the home screen of the macbook can be seen on the TV. I feel like it shouldn’t be this complex (not difficult per say, but harder than it should be) to do something so basic as playing a video with the lid closed. Thank you very much for these instructions. Very helpful. For no audio in HDMI option, you need to purchase an external sound card and connect by FireWire (fastest). Connect HDMI output to HDMI input on video source (if another is available on source) or run composite or component or optical sound cable to video source( TV monitor), from external sound card outputs of choice. Look at Focusrite for the most quality and economic. Guitar Center carries them. Note: these days, current external sound cards connect using Thinderbolt, which is faster than FireWire. Latency (sound delay) is not an issue. Gefen among other companies makes a video and sound combo box with hdmi out and inputs to accept your video and audio specific cables to combine them into one HDMI cable to connect to your tv. Works great. Choose sound card for audio output in system preferences, which will be by FireWire or thunderbolt depending on which you used. I did this for my home theater system and connected it to my 60 inch tv. You can go directly to a monitor and use the built-in monitor speakers or and audio source with more superb sound. Great tutorial! I’ve got everything hooked up to my MacBook but the display on the tv cuts off the top and bottom of the MB screen so I can’t see the menu bar at the top or the icons at the bottom of the screen. Any suggestions? I’m trying to play audio and video from my mac to my computer. The problem I’m encountering is that the sound and video flickers or pauses then starts again. I tried one suggestion that I read from the feed by going into preferences and switching output to hdmi but this did not resolve my issue. I have a presentation for tomorrow and this has become really stressful. Can you please assist to resolve my issue? Personally, I would recommend just using ArkMS app, it’ll be cheaper than buying all these cables and adapters. I use it and it’s pretty good, works smoothly, without bugs, wirelessly streams all the media from my Mac to different devices. Can you answer this simply: Watching your Imac Through a TV Great. But how do you turn of the imacs Display while doing this having two displays is distracting. on a windows laptop one can do this easy there is a key for it top of the keyboard. How can one do this easily on an Imac. There is another issue as well I bought a 3 way switcher of ebay it worked very well. Then something happen to it and had to be replaced. Same scenario with exactly the same switcher i received through Ebay. Red light came on when imac was plugged in. 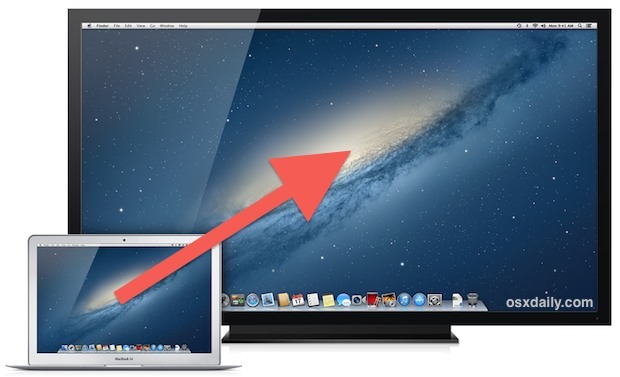 also the imac was seeing the Samsung TV in the display properties. But no signal was passing through. Ironically i plugged the Thunderbolt cable HDMI end into a Yamaha RX-850 AV amplifier using the Yamaha HDMI pass through. Stunning picture from the Imac. I am having the same trouble with the cox contour site. Anyone have a solution? Audio works with quicktime player, as well as youtube. I have monitors connected via USB C and HDMI (via Apple adaptor) to my MacBook Pro. 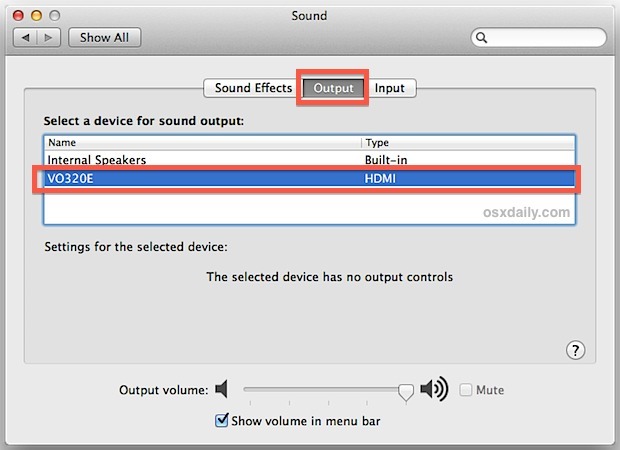 However, the only option in the Sound Control Panel is “internal speakers.” How do I get my Mac to “see” the other output options? I have 2010 imac desktop, and am trying to use viseo flatscreen as my display. Im using thunderbolt (or mini display) to hdmi cable – no adaptors, just single cable with hdmi on one end and thunderbolt on the other. Imac is not recognizing any alterbative display whatsoever. Secondly, i tried using a thunderbolt to dvi cable, with a dvi to hmdi adaptor… still sane results – no recognition. I use a mac air. I couldn’t find an Arrangements tab in Displays.